One of the benefits of owning a notebook system that accommodates multiple booklets is that not all of them have to be notebooks. 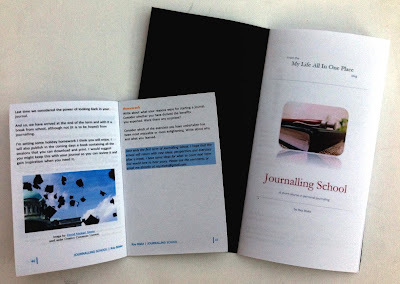 With the templates I am releasing today it is a simple matter to use your own content to print and bind information booklets on any topics of your choice. My templates are set up ready for you to paste in your own material, which could be text, pictures or anything you want. Information booklet template - FN size - this produces a booklet measuring 140mm x 90mm, the same as a Field Notes book or a Moleskine Pocket Cahier. Once you have added your own content, print the file double-sided on A4 paper in booklet mode. You can then bind the sheets into a cover and trim. This post will show you how. I really love your insert templates and I've printed some of yout lined notebooks but still unsure how to print in booklet mode. Is that a setting I have to tell my printer or is it a setting in Word? I just couldn't work it out and it kept printing in A4 size on my page. Please help. What is booklet mode? Booklet mode is a printer setting, supported quite widely, but not by all printers. Look in your printer preferences to see if your printer will support it. If it doesn't you can download an app called FinePrint that will perform a similar function for you. AH! I am so excited about this!!! You are much too clever Ray, So I thank you very much for that!